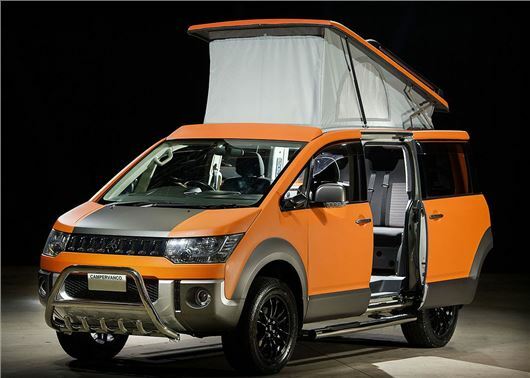 Campers Scotland is entering the 4x4 camper van market with the launch of the D:5 Terrain. Priced from £27,995, the rugged off-roader is based on the Mitsubishi Delica and powered by a 2.4-litre petrol engine. Designed for buyers who want a true off-the-grid camping experience, the D:5 Terrain features chunky body and wheelarch cladding, switchable four-wheel drive and a locking diff that should make it apt for tackling snow, mud and sand. It will also tow up to 2.5 tonnes, with its four-cylinder petrol engine developing 170PS and returning an official 27mpg. The base for the D:5 Terrain is a 10-year-old Mitsubishi Delica van, which Campers Scotland import from Japan before performing the conversion in-house at its HQ in Grangemouth, near Falkirk. It isn’t clear how many miles each base vehicle will have covered before the conversion is carried out, but Campers Scotland provides a 12 month mechanical warranty and a 24 month guarantee for the conversion fixtures and fittings. The D:5 Terrain camper van provides space for four adults, with its pop-up roof providing a double bed and the rear seats folding flat to accommodate two adults below. Inside the camper gets two induction hobs, fridge and storage for clothing, cutlery and provisions. The lithium ‘super-power’ battery is topped up by solar panels on the roof, while USB ports should make it easy to charge phones and tablet computers. Optional accessories include electric powered side doors, off-road wheels, raised suspension, chassis strengthening and LED flood lights. The D:5 Terrain is only available from Campers Scotland in Grangemouth for now, but the company says it has plans to are expand its service reach across the UK so it can collect vehicles from customers for warranty work or appoint local partners for work when needed.